Research Gate on 2 December 2015 for public dissemination. Is Nevada Overharvesting Black Bears? were not explained by Lackey et al. communicated to them by me. California has some of the best, Nevada’s endogenous growth was presumably λ < 1.0157.
anthropogenic causes, especially in conflict situations and vehicle collisions (Beckmann and Lackey 2008). is still > 0 %/yr. and Berger (2003a,b)– or from California. how it varies with drought, would also be enlightening. responses of black bears (Ursus americanus) to altered food. Journal of Zoology (London) 261:207–212. models experimentally. Journal of Mammalogy 84:594–606. history of black bears. 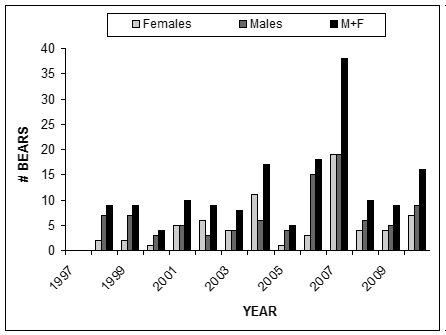 Human–Wildlife Conflicts 2:79-83.
report- Board of Wildlife Commissioners, September 23, 2011. Nevada Department of Wildlife. increase of a once-extirpated population in Nevada. Journal of Wildlife Management 77:812–820. Agency, Department of Fish and Wildlife. 13pp. Figure 1. Numbers of live bears captured for the first time in Nevada (Lackey unpubl. FOIA data).